Earlier this year we revamped our set of country pages – pages which are designed for prospective students from around the world. 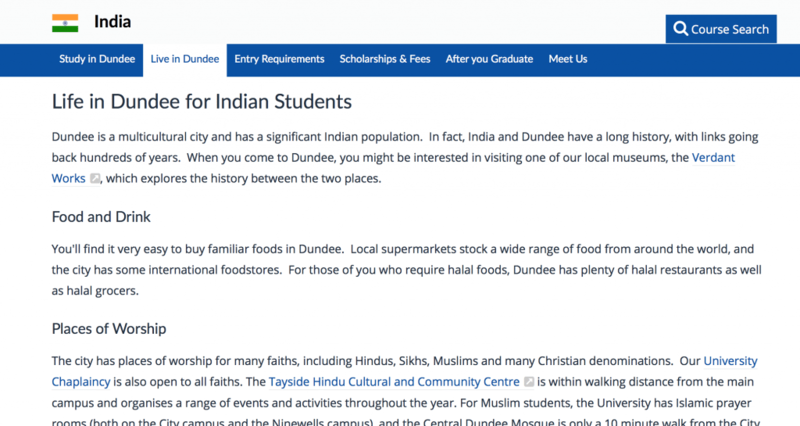 These pages help students to become better informed about the University and city and cover topics such as entry requirements, fees and funding, information about visits by the international recruitment team, and general information about life in Dundee. We currently have 104 different country pages, so needed to prioritise. Previously, the vast majority of content on each page was identical, with obvious exceptions such as entry requirements. However, we know that whilst core user needs are the same (e.g. all want easy-to-find fee information), students from different parts of the world place varying importance on different aspects of university life. For example, students from China are more concerned with rankings and employment opportunities, whereas for students from Malaysia, we have a greater challenge in selling our location. After consulting with the International Recruitment team and student societies, we found that one area where it was really important to tailor our content to a specific country was that relating to life in Dundee. Whilst we want to highlight our strengths and any differences to the user’s home country, we also needed to reassure them that they would not be entirely cut off from important aspects of their own culture. Some of this content included information about the availability of particular foods – halal foodstores and African/Caribbean grocers for example – and information about the provision of worship for different faiths, or any local community groups which might be of interest. Where they exist, we have also highlighted relevant student societies – the Singapore Society, the Indian Society, the Islamic Society and the Malaysian Society amongst others. One of the top selling points of the University is the excellent student experience we provide, and such societies are a key part of that. As it’s generally more difficult for prospective international students to attend an open day at the University, showing off aspects of the city and campus and providing visual content is exceptionally important. We have integrated images from various Facebook albums – some of them our own images of the city and campus, others of them images of society events – and included these in a grid on the page to make a striking visual splash and a way to break up the textual content. Clicking on a single image gives users the opportunity to interact with the photos by ‘liking’ them or commenting on them, and also to view the rest of the photos in larger albums. This has the added advantage of encouraging users to explore our wider Facebook offerings. Facebook is a channel we know certain international students are keen to engage with before making more ‘formal’ enquiries. We have also added relevant video to the pages where possible, ensuring that it will not prevent the pages from being viewed in countries such as China which censor certain content. Student testimonials play a crucial role in selling the institution to prospective students, who are more likely to be convinced by content written by their peers as opposed to that produced by the University. Students, in giving us material to use, will also unwittingly tend to focus on the issues which are important to those coming from their own countries. We have greatly increased the amount of student-derived content on the pages, both in the form of written testimonials accompanied by a photo of the author, and video interviews where possible. Additionally, with assistance from Alumni Relations, we have included examples of graduate destinations. A student who is investing a significant amount of time and money attending the University would like to see that there is a chance of a good return on that investment. Using software which captures a user’s journey through the website, we we were struck by how many seemed to navigate straight to entry requirements. Heatmaps supported the assertion that this was the most important piece of information for the majority of our users. We altered this so that the user could choose to view only the information that was important to them and the rest remained hidden and would not distract them from their task. As our country pages had not been updated for a considerable period, it was also time to update the content which is shared across the pages. It was important for us to consider that the country page was in some cases the first page a user came to on our site, and so it needed to provide enough information about the different topics that a prospective student was interested in (much of our traffic comes straight from google). Our degrees, for example, are structured differently to those offered elsewhere in the world, and we found this was one of the most heavily read sections on the page. This was therefore a great opportunity to highlight the advantages to studying under the Scottish system. We also learnt quite a lot ourselves in the process of updating this information – did you know that in the US, you can’t go straight into a medicine or law degree as you can here, but need to take pre-med or pre-law first? We aimed to improve links to and from the rest of our website. As mentioned, the country page could be a user’s first engagement with us, and it is important that this page serves as a landing page to point them off to other relevant areas of the main University website. Links to our student life pages, for example, were made more prominent. There are several tools we can use to see whether our changes have had any effect. Using Google Analytics, we can look at a number of metrics. 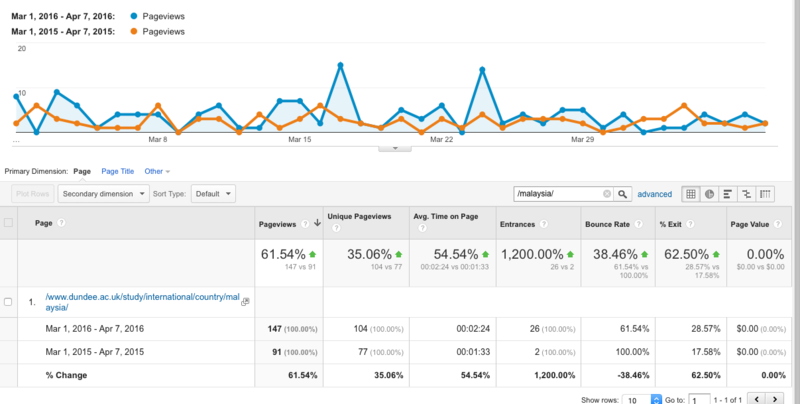 Focusing on the Malaysia page, we can see that traffic to the page is up 61.5% compared to a year ago. This sounds impressive, but is not in fact the best way to measure the success of the page as in this case, it was probably caused by a more aggressive marketing campaign within the country itself. For our purposes, length of time spent on the page seems to be a more useful measure of how well the page is performing. For Malaysia, the time spent on the page has increased by a massive 54.5% – users are spending almost a minute longer reading the content. This is very promising as it suggests they are engaging with the improved content. Tracking software, which shows which part of the page have been clicked on and scrolled to, shows that around 50% of users are now scrolling to read the new information about life in Dundee, which is a really good result. As the new pages have only been online for a relatively short period, it is more difficult to say whether the increased links between the course and country pages are bearing fruit as we have only a limited dataset to analyse. Initial results seem promising, particularly from country pages to course pages – there have been 39% more visits to postgraduate pages from the country pages and 52% more to the undergraduate pages. Since we updated these ‘top ten’ countries, we have continued to work on content for countries which are significant for international recruitment. For other, less critical markets, we have made basic changes (making entry requirements more readable, for example). One of the weakest areas of the pages is the scholarship section. In future, we would like to be able to show the most relevant opportunities on the country page itself, rather than directing the prospective students elsewhere. 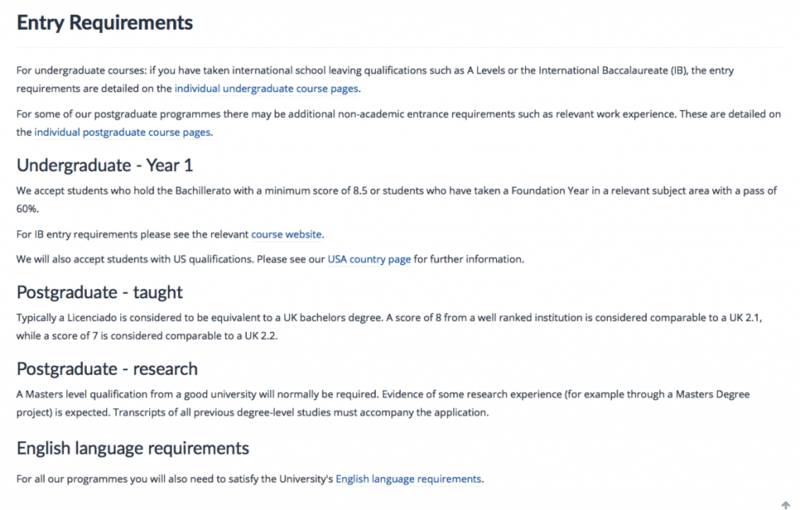 We know this is of crucial importance to international students and it will hopefully form part of a wider project. We would also like to include even more examples of graduate destinations on the employment section of the page as recent studies have confirmed this is of great interest to prospective students from our key markets. As always, if you have any comments on the work we’ve done and are yet to do, please get in touch by leaving a comment below. Claire graduated from the University of St Andrews - MA (Hons) History (first class), MLitt Historical Research (with distinction) and PhD in Scottish History. She began working at the University of Dundee in 2008 as a web content editor.